Contains herbs traditionally used to reduce fatigue, improve stamina and support the nervous system. 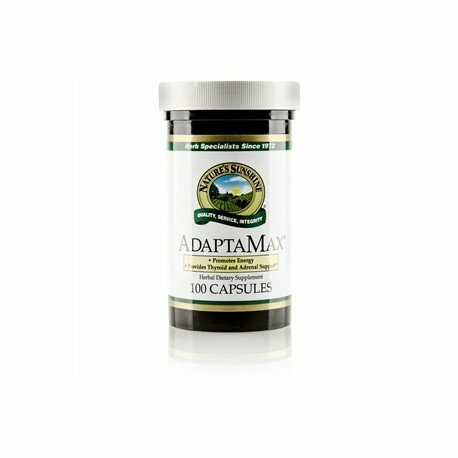 Adaptogens help the body buffer the effects of stress and adapt to stressful situations. AdaptaMax’s adaptogenic strength comes from rhodiola, eleuthero, Korean ginseng, ashwaganda, rosemary, gynostemma and schizandra. Together these herbs were traditionally used to reduce fatigue and improve stamina. Other ingredients in this formula include nutrient-rich herbs like astragalus, reishi mushroom, suma and ginkgo to fortify the nervous system. Alfalfa and kelp support the thyroid, and chromium and our fruit and vegetable base provide nutrients to nourish the body. 40 mcg chromium, Korean ginseng root extract, rhodiola root extract, eleuthero root, gynostemma whole plant extract, ashwagandha root, schizandra fruit, suma bark, alfalfa aerial parts, astragalus root, kelp leaves and stems, reishi mushroom mycelia, rosemary leaves extract, ginkgo leaves extract, broccoli flowers, carrot root, red beet root, rosemary leaves, tomato fruit, turmeric root, cabbage leaf, grapefruit bioflavonoid, hesperidin and orange bioflavonoid. Take 2 capsules with a meal two to three times daily. NOTE: Pregnant or lactating women should consult their health care professional prior to taking this supplement.